Try Molzym’s contamination-free PCR/Real-Time PCR products for the sensitive detection of bacterial and fungal DNA. Available are reagents for custom assay development and complete 16S and 18S assays. Polymerases, water and master mixes are manufactured free of microbial DNA and are high in amplification activity over 40 cycles. Master mixes contain all reagents for assays to be used with custom primers. Complete assays are available for the sensitive PCR/Real-Time PCR detection of parts of 16S and 18S rRNA genes of eubacteria and fungi, respectively. Amplicon sequencing primers enable their identification. Our special purification technology removes traces of DNA from PCR reagents. Taq and master mixes unfold highest sensitivity and reliability of detection of microbial DNA in assays employing your own primers. A series of kits is especially dedicated to the sensitive and specific detection of bacterial and fungal DNA in samples. All reagents are manufactured DNA-free with respect to microbial DNA contaminations. Likewise, the reagents are highly active in their amplification performance, allowing up to 40 amplification cycles without background in negative controls. 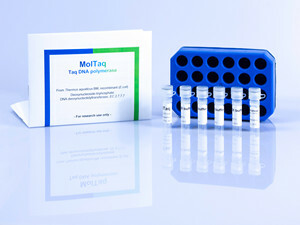 DNA-free MolTaq 16S/18S and Hot MolTaq 16S/18S are the Taq DNA polymerases of choice if you experience contamination problems with other standard Taqs. The new developed Hot MolTaq 16S/18S combines the favourable characters of MolTaq 16S/18S with hot start amplification and thereby increased specificity. Master mixes contain pre-assembled reagents necessary for PCR, including dNTPs, buffer, Mg2+ (3mM final concentration) and BSA. 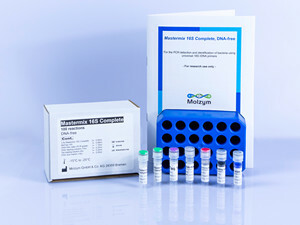 Mastermix 16S/18S Basic is a ready-to-go master mix – just add your validated PCR primers and probes. Mastermix 16S/18S Dye is the master mix of choice if you want to run Real-Time PCRs with your primers using an intercalating dye. Assays are available for the detection of bacterial and fungal DNA. They possess high activity for the amplification of hypervariable regions of the 16S and 18S rRNA genes down to femtogram amounts. Many applications demand a very sensitive and rapid detection of bacterial and/or fungal DNA. Such applications comprise microbial DNA analysis in clinics, quality testing of food and pharma products and contamination control of biotechnological processes. Molzym offers PCR and Real-Time PCR assays that test for even traces of bacterial and fungal DNA in a sample. Manufacturing under strict quality measures for the absence of DNA contamination guarantees reliable results from test to test. Tardif KD, Schlaberg R (2017) Development of a real-time PCR assay for the direct detection of Candida species causing vulvovaginal candidiasis. Diagn Microbiol Inf Dis, doi.org/10.1016/j.diagmicrobio.2017.01.012. Hammer A, Wolff D, Geißdörfer W, Schrey M, Ziegler R, Steiner HH, Bogdan C (2017) A spinal epidural abscess due to Streptobacillus moniliformis infection following a rat bite: case report. J Neurosurg, DOI: 10.3171/2016.12.SPINE161042. Moore MS, McCarroll MG, McCann CD, May L, Younes N, Jordan JA (2016) Direct screening of blood by PCR and pyrosequencing for a 16S rRNA gene target from emergency department and intensive care unit patients being evaluated for bloodstream infection. J Clin Microbiol 54, 99–105. Kacerovsky M, Musilova I, Jacobsson B, Drahosova M, Hornychova H, Rezac A, Andrys C (2015) Cervical and vaginal fluid soluble Toll-like receptor 2 in pregnancies complicated by preterm prelabor rupture of membranes. J Maternal-Fetal Neonatal 28, 1116-1122.